On the Feb. 26 episode of SmackDown Live, Kofi Kingston, a Ghanaian-American who has captivated audiences with his newfound underdog status, made his way to the ring amid chants from the crowd. Waiting for him in the ring was WWE heavyweight champion Daniel Bryan, the diminutive, ultraliberal white character who was holding a contract signing for an upcoming championship defense at the Fastlane pay-per-view. After 11 years with the company, Kingston was finally getting a one-on-one title shot. But before pen met paper, WWE chairman and CEO Vince McMahon, who has played an on-screen villainous boss character the past two decades, made his way from backstage. McMahon told Kingston that, while he appreciated all the work Kingston had put in over the years, he believed another wrestler — Kevin Owens, a portly white grappler who was hired in 2014 — was “more deserving” and “more qualified” to warrant a title opportunity. McMahon promptly removed Kingston from the championship match. Thus is the story of Kofi Kingston. Good enough, but not twice as. Kingston, whose real name is Kofi Sarkodie-Mensah, debuted with WWE in 2008 as a Jamaican Rastafarian, rocking yellow and green trunks and beating opponents with his finishing move, Trouble in Paradise. (After a year, Kingston suddenly dropped his “Jamaican” accent and, last name aside, has been more open about his family roots: “I definitely take a lot of pride in my Ghanaian heritage.”) As one of the more athletic and charismatic wrestlers in the company, Kingston found success, albeit to a certain extent. Kingston has been given a showcase segment during every Royal Rumble, WWE’s annual battle royal, in recent years, avoiding elimination by handstand or office chair. Of the nine male championships that have been active since 2008, Kingston has won five of them, including holding the tag team championship, as a member of The New Day, for a record-breaking 483 consecutive days. None of the championships, though, was one of WWE’s prestigious heavyweight titles. Since “Nature Boy” Buddy Rogers was crowned the inaugural WWE champion in 1963, only three black men have held one of the company’s heavyweight titles: Mark Henry, Booker Huffman, also known as Booker T, and Dwayne “The Rock” Johnson. But on Sunday, after overcoming McMahon’s earlier interference (more on that later), Kingston will challenge Bryan for the WWE championship at WWE’s premier annual event, WrestleMania. If Kingston were to win, he’d be not only the fourth black heavyweight champion but just the third black person ever to win any championship at WrestleMania. Success in professional wrestling, unlike in, say, football or basketball, is not dictated by physical or athletic prowess; that is no more clear than in the size discrepancy between the two current WWE heavyweight champions, Brock Lesnar and Bryan: Lesnar, a former UFC champion, is 6 feet, 3 inches and weighs more than 265 pounds, while Bryan is billed as 5 feet, 8 inches and weighs barely over 200 pounds. Still, black wrestlers have rarely been positioned in WWE as championship-worthy. According to an online wrestling database, a black wrestler hasn’t been involved in a one-on-one heavyweight championship match since 2013. Kingston’s current positioning even took some form of divine intervention — the reported concussion of another wrestler led to Kingston being a last-minute addition to the championship picture. What has been stunning about Kingston’s current storyline with Vince McMahon is how much it diverges from typical WWE narratives involving black wrestlers, which in the past have used casual racism and blatant stereotypes as a crutch to elicit guttural reactions from the audience. Booker T was called nappy-haired and told to dance by his white opponent in 2003. Henry had to shut down being nicknamed the “silverback” four years later. Even The New Day were participants in a (admittedly enjoyable) rap battle in 2017. But the story WWE is telling with Kingston feels like foreign territory. For more than a month, the Kingston character has proved he’s worthy of a championship match, only for McMahon to continually place impediments in his way. Kingston was pulled from Fastlane at the last minute and two weeks later had to wrestle for 60 minutes straight to earn the championship match again, which he did before McMahon changed the stipulations yet again, with Kingston losing in the end. It’s the classic “employee versus boss” Hollywood trope: McMahon placing seemingly insurmountable hurdles in front of Kingston like a college admissions board. But the blue-collar, working-class everyman in these scenarios is normally white. Majority audiences can identify with Homer Simpson, Archie Bunker, Al Bundy or Roseanne Conner. Not so much with someone who looks like Kingston, with his tattoos, sneakers and locs. But audiences can identify with family, hard work and loyalty, which has been the genesis of Kingston’s drive to the WWE championship. He has been in the company for 11 years, missing out on birthdays and trick-or-treating with his kids. While Kofi Kingston’s hourlong match was scripted and predecided, Kofi Sarkodie-Mensah still had to exert himself on-screen for four times the amount of time other wrestlers normally have to. His blackness, be it as it may, has become a secondary matter, although it hasn’t been lost on Kingston what it would mean for others to see a black WWE champion. 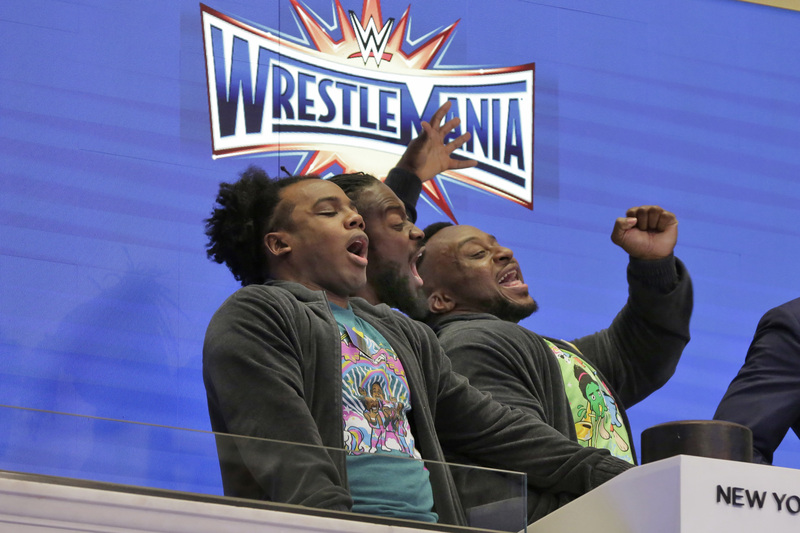 From left to right: WrestleMania 33 participants Xavier Woods, Kofi Kingston and Big E, who together form The New Day, ring the New York Stock Exchange opening bell on March 27, 2017. At the same time, Kingston and The New Day have been trying to redefine what “blackness” means or looks like. Black WWE wrestlers have typically been either “athletic,” “angry” or “arrogant” — or, in the case of Johnson, a combination of all three. The New Day didn’t want to be forced into any of those stereotypical boxes, seamlessly incorporating gamer, anime and mystical (they used to wear unicorn horns aptly nicknamed “plastic protrusions” on their heads) culture into their act. In recent years, WWE’s handling of race and its black wrestlers has, relatively speaking, improved. Where there were once offensive mammy archetypes, blackface and manservants, black wrestlers now are mostly just … wrestlers. Trinity Fatu, who goes by Naomi, evolved from a twerking cheerleader to embracing neon lights and “feeling the glow.” For over a year, Thaddeus Bullard, known as Titus O’Neil, was the face of Titus Worldwide, an obvious parody of LaVar Ball’s Big Baller Brand. Backstage politics aside, any mention of race these days, including in Kingston’s case, feels more like WWE holding a mirror up to society … and itself. A month after Kingston’s aborted contract signing on SmackDown Live, McMahon offered him one last chance to earn a match at WrestleMania. As Kingston did the previous week, Woods and Big E had to defeat five tag teams in an hour to stamp Kingston’s ticket to a WWE championship match. The New Day eventually prevailed, and as their music played, Kingston sprinted to the ring as the crowd, for what felt like the 100th time, drowned the arena in “Kofi, Kofi, Kofi!” chants. WWE later posted a video of the three men talking backstage, holding back what appeared to be legitimate tears, tears more so for Kofi Sarkodie-Mensah than for Kofi Kingston. Three years ago, the trio told The Undefeated that in the event one of them ever won an individual championship, in their eyes they would all have won that championship. “This is what it’s all been about,” Kingston said, the tears struggling to stay away. “We’re one day closer. We’re going to Mania, guys. Associate editor Maya A. Jones contributed to this report.